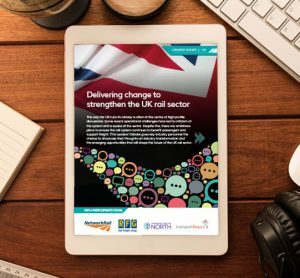 20 Miles More Ltd is an independent business-led organisation that is campaigning for a direct link from Liverpool to High Speed 2 (HS2) – the high-speed rail route linking London to the Midlands and North of England. Director Martin Sloman explains what the campaign is all about and what has been achieved so far. We came into being in response to the release of the Government’s Preferred Route for Phase 2 of HS2 in January 2013. This made clear that, whilst Liverpool would be served by HS2 rail services, the network, as planned, would put the city and region at a serious disadvantage in comparison to competitor cities. Lack of awareness regarding this issue amongst local politicians and media prompted local businessman, Andrew Morris, to start a campaign which was to become 20 Miles More (20MM) – 20 miles being the distance from Liverpool to the proposed rail route. Our first activity was to engage with the Phase 2 consultation process. We realised that simply responding to the consultation questions, which made no reference to strategic issues, would not be sufficient. We decided to produce a report making the economic, transportation and engineering case for Liverpool to be fully integrated into HS2. The report was to form the centrepiece of the launch event for 20MM which took place in Liverpool’s iconic Liver Building on 31 January 2014 – the last day of the consultation process. 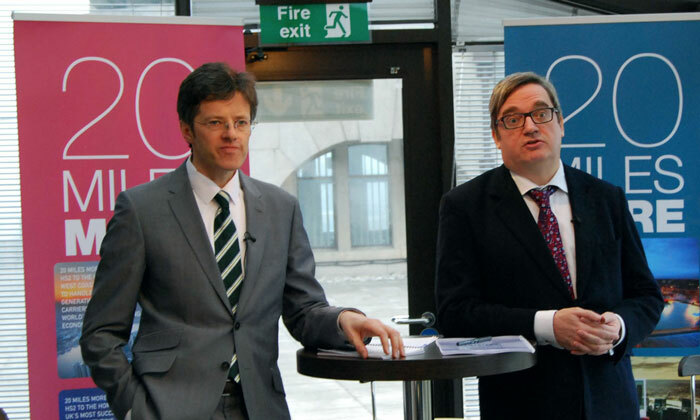 The event, hosted by Andrew Morris and Phillip Blond of think-tank Respublica, attracted both press and TV coverage. It was accompanied by a letter to the Times signed by local business and political leaders and national transport experts. So, what is it that we are complaining about? At a first glance, Liverpool does very well out of HS2. From the completion of Phase 1, Liverpool will be connected to the capital by trains capable of 400km/h and, on completion of Phase 2, journey times will be half an hour shorter than they are at present. Furthermore, we will have two trains per hour throughout the day – double the current off-peak number. The problems arise from the lack of any dedicated infrastructure to serve Liverpool and the City Region. Trains heading to the city will depart the HS2 route south of Crewe and complete the last 35 miles on the Victorian rail network. Not only does this incur a significant time penalty but restricts the type of trains that can be used. Liverpool passengers will travel in 200m-long ‘classic compatible’ units, rather than the wider 400m-long ‘captive’ trains that provide services to Birmingham, Manchester and Leeds. These drawbacks are compounded by the fact that track capacity on the existing congested route north of Crewe will not be released, so depriving the city of one of the principal benefits of the new rail route – the ability to develop new passenger and freight services on the existing rail network. Given the tendency of commentators to reduce the Liverpool HS2 argument to football rivalry, we are cautious about comparison with our neighbouring city of Manchester, but this is often unavoidable. 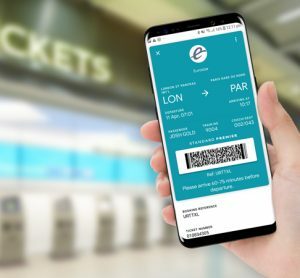 Manchester will experience London journey times that are half an hour shorter than ours plus three trains per hour giving triple the Liverpool capacity. The economic impact of this disparity was made clear by HS2 themselves. In September 2013, they published a report commissioned from economic analysts KPMG. This revealed that the maximum economic uplift for Liverpool would be one of the smallest of all the cities and towns on the HS2 network and the minimum was actually negative. So, a £50 billion plus investment in ‘rebalancing the British economy’ may actually damage one of the areas it claims to serve! 20 Miles More is not just a ‘nice to have’, it is something vital to ensure the prosperity of the Liverpool City Region going into the future. And it is not just about us. The exclusion of one of the country’s largest city regions from its main transport network diminishes the impact of this once in a lifetime investment. The city of Leeds, properly connected to HS2, will experience some four times the GVA uplift of Liverpool. We want our city and region to be at the forefront of the UK economy – something especially important in the post-Brexit era. The publication of the report was the first in a series of activities that 20MM has undertaken in the four years since its launch. These have included meetings with MPs, senior HS2 officials, talks to local businesses, responses to subsequent consultations and an ongoing dialogue with Merseytravel, which we have carried out whilst maintaining our independent role. As with any campaign group, the impact of our activities is difficult to measure. The response to the consultation process by HS2 was not encouraging in that it practically ignored the Liverpool argument. However, by that time the agenda had shifted. The concept of Northern Powerhouse Rail had emerged, a west-east rail route starting in Liverpool and linking us via Manchester to Leeds, Sheffield, Hull and Newcastle. That the first stage of this route will be the 20-mile link from Liverpool to HS2 didn’t escape our attention. Not only would Liverpool be directly connected to HS2 – the main aim of our campaign – but a new route would be opened to Manchester Airport, Manchester and then across the Pennines. The route networking possibilities of a Liverpool HS2 link had been mentioned in our report so we would like to claim this idea as our own! It all seems very positive, but we need to temper our enthusiasm by realising that, to date, there are no definite route plans, no timescale and no funding identified. In particular, the location of a Liverpool terminal – one of the issues that occupied us when producing the 20MM report – has yet to be identified. What is undoubtedly encouraging though is that the Liverpool HS2 link is now firmly on the political agenda. How much of that is down to 20MM we can’t say, but we intend to carry this work forward as the HS2 project progresses. Find out more about 20 Miles More and read the consultation report here. 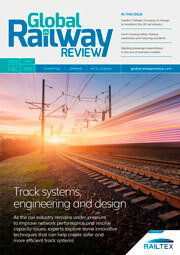 Martin Sloman is a civil engineer with a background in the railway industry. He has worked as a project engineer / principal engineer on major projects including Thameslink and the East Anglia and West Coast Route Modernisation projects. HS2 IS FOR LONDON. It is to address the problem of London’s severe shortage of affordable housing. When built, thousands of skilled jobs will be re-located to London from the North and Midlands, sucking wealth from the regions into the capital. Grayling is cutting spending on anything that does not achieve this objective. It is not going to create thousands of jobs either. They refer to jobs that will be done by moving people from other tasks, and they are TEMPORARY. HS2 has spent millions of pounds of TAXPAYER’s money on PR companies to convince the TAXPAYER that HS2 is a good idea and still the vast majority of the public think the opposite. This is and outdated, poor value, white elephant designed to benefit London at the expense of the North and and Midlands. Liverpool would do better without it! A lot of the physical aspects of a Liverpool dedicated connection to HS2 depends on the west-east NPR, which is yet to be designed in broad brush, unlike HS2. To merge the two, HS2 north of Crewe needs redesigning, with HS2 subservient to NPR. 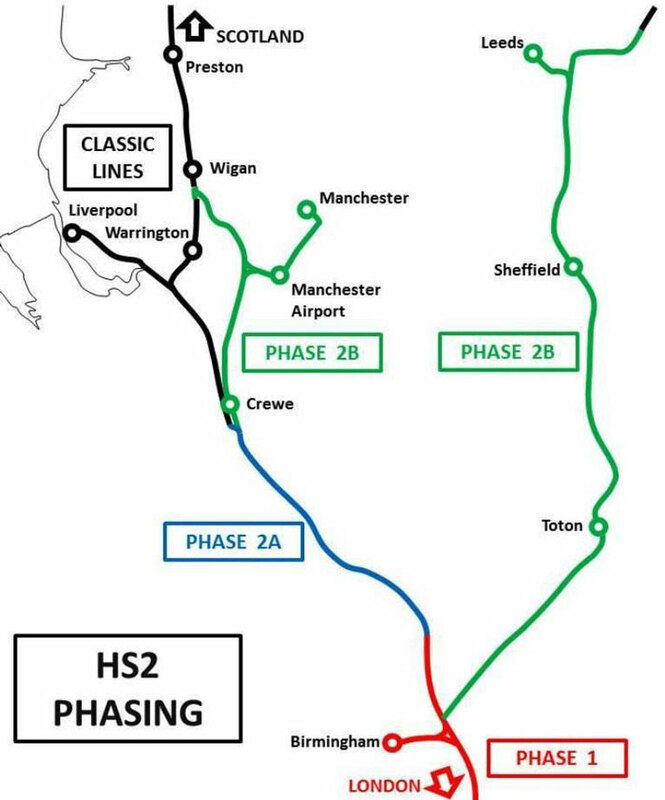 That is design NPR to be the most efficient straight as possible west-east route then redesign HS2 north of Crewe to branch into it. 20MM’s remit is to have Liverpool connected with a dedicated link to HS2, not promoted NPR or redesign HS2 north of Crewe, which is understandable, as they would be casting their nets too far, and losing sight of their prime focus. 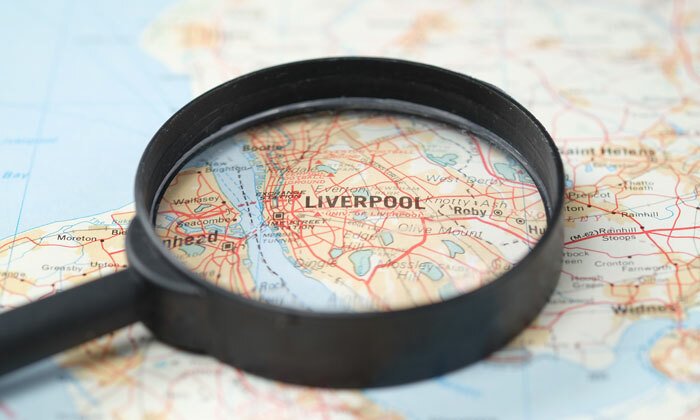 TfN have stated they want a new line from Manchester to Liverpool, which will alleviate existing lines for freight use, as the Port of Liverpool expands. The port has not yet fully brought online its new post-Panamax container terminal, which will berth ships holding 20,000 containers – the average sized container ship is 5,000 for comparison. Brexit, focusing more on the rest of the world and importing eco wood pellets from North America for power stations phasing out coal, will put more pressure on the existing rail network into the Liverpool City Region. What route will this new NPR rail line between Liverpool and Manchester take? As Martin Solman wrote, 20mm have proposed a route however feedback is that it may go via Warrington, which makes sense to serve that large town. North of Runcorn the Manchester Ship Canal is pretty well redundant. A few coasters per week reach Irlam. This pretty well straight transport artery between the two cities can be put to much better use by infilling three quarters of it leaving a small boat canal and two high-speed rail lines. The canal runs though Warrington. Peel, the owners would most likely welcome such a move, as the near straight canal route again will become lucrative. The canal NPR route can be in a tunnel from the Centenary Way in Salford by-passing Salford Basin into the west to east aligned Manchester Victoria. HS2 can branch into the west-east high-speed NPR canal route as it runs north to Preston, which will serve both cities for HS2 access; Manchester Victoria would be the HS2/NPR station. NPR then will be pretty well straight and not curve to the south then north east. The currently planned circuitous HS2 route around Tatton, slowing trains down greatly, and the 7.5 mile tunnel into Manchester Piccadilly is omitted, saving a considerable amount of money. Manchester airport HS2 station will be omitted. This after-thought of a station is planned not to integrated with the existing Manchester airport station, with the two being a mile apart, and would be in danger of being one of the least used stations in the UK. The HS2 Heathrow link was omitted from HS2, Manchester Airport station should follow.